Kevin Spacey and Robin Wright returns for The House Of Cards season 5 DVD. In the midst of the presidential election, tensions mount in the White House as Frank (Golden Globe winner Kevin Spacey) and Claire (Golden Globe winner Robin Wright) continue to navigate their political careers and redefine their relationships - particularly with each other. Season five of the Emmy Award-winning political drama is marked by violent power plays, new alliances, stunning betrayals and, as always, a desire to win at any cost - and not just from Frank Underwood. 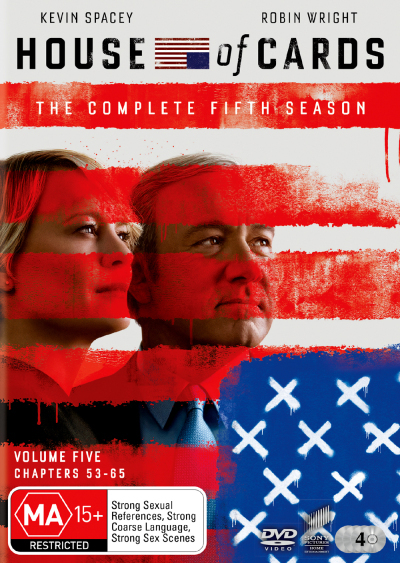 Click the button below to add the HOUSE OF CARDS - COMPLETE SEASON 5 to your wish list.